For more than three hundred years, Bluff House has sat above Whiskey Beach, guarding its shore — and its secrets. To summer tourists, it’s the crown jewel of the town’s stunning scenery. To the residents of Whiskey Beach, it’s landmark and legend. To Eli Landon, it’s home. . . . A Boston lawyer, Eli has weathered an intense year of public scrutiny and police investigation after being accused of murdering his soon-to-be ex-wife. And though there was never enough evidence to have him arrested, his reputation is in tatters as well as his soul. He needs sanctuary. He needs Bluff House. While Eli’s beloved grandmother is in Boston, recuperating from a nasty fall, Abra Walsh has cared for Bluff House, among her other jobs as yoga instructor, jewelry maker, and massage therapist. She is a woman with an open heart and a wide embrace, and no one is safe from her special, some would say overbearing, brand of nurturing — including Eli. He begins to count on Abra for far more than her cooking, cleaning, and massage skills, and starts to feel less like a victim — and more like the kind of man who can finally solve the murder of his wife and clear his name. But Bluff House’s many mysteries are a siren song to someone intent on destroying Eli and reaping the rewards. 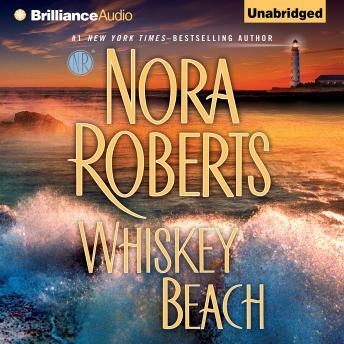 He and Abra will become entangled in a centuries-old net of rumors and half-truths that could pull them under the thunderous waters of Whiskey Beach. . . . Passion and obsession, humor and heart flow together in a novel about two people opening themselves up to the truth — and to each other. I couldn't wait to get in my car and go to work (or back home) so I could listen to more! Loved the story, characters and even the narrator! This book is very in joy able.